Kolkata is a city with a discernible pulse — a chaotic beat that marks time as the teeming masses ebb and flow through the city’s crowded arteries. Somehow I always feel a bit more alive when I am in the stream of things in the City of Joy. Whether I am riding in a cab, sitting on a rickshaw, or simply walking down dirty sidewalks made uneven by the incessant beat of a billion peripatetic steps, I feel strangely at home here. Kolkata is also the kind of place that reminds you that you have five senses. It’s not a quiet and sanitary place where you feel at ease. Kolkata is instead a place that will unapologetically assault both your senses and sensibilities. You cannot remain passive about life when you are in Kolkata. You have to engage and participate in the dance at some level. And the more you do, the more you appreciate the rhythm of the city. At Bhubaneswar’s new airport. Waiting for my flight to Kolkata. After a long drive yesterday from the Khondhamal Hills to Bhubaneswar, the capital city of Orissa, I arrived at the brand new airport only to find out that my flight would be delayed three hours. Rather than spending the next six hours at the airport, I purchased a cheap ticket on another airline and arrived in Kolkata more than an hour before my delayed flight would have departed. My old and dear friend Don picked me up at Kolkata’s brand new airport to take me to my guesthouse. “Welcome home to Kolkata,” said Don. When we arrived at the guesthouse late at night, the guards brought me my key and said, “Welcome back. You will be staying in your favorite room.” Everyone on duty came out to say hello as though I had just come back from the dead. Then, I strolled to the hotel across the street for a late night bowl of sweet corn soup and an orange Fanta. I wasn’t too hungry but just needed an excuse to visit an old friend who waits tables at the restaurant. Early this morning, Samir, the laundryman at the guesthouse, knocked on my door. When he saw me, he smiled and said, “Welcome back, sir. They told me you were coming and I have been waiting to see you.” We talked for about ten minutes. I wanted to know the latest on his family and how they are doing in their small village located hours from Kolkata. Samir works hard in this big city just to send a little money back to his wife and kids. Then I ventured out to visit with the beggars who live on the street in front of the guesthouse. I know all of them and they know me. “Hello Uncle,” they cried, “welcome back to Kolkata.” One of the rickshaw wallas ran up and said, “Uncle, do you remember me?” Of course, I did. And it was good to see him again. 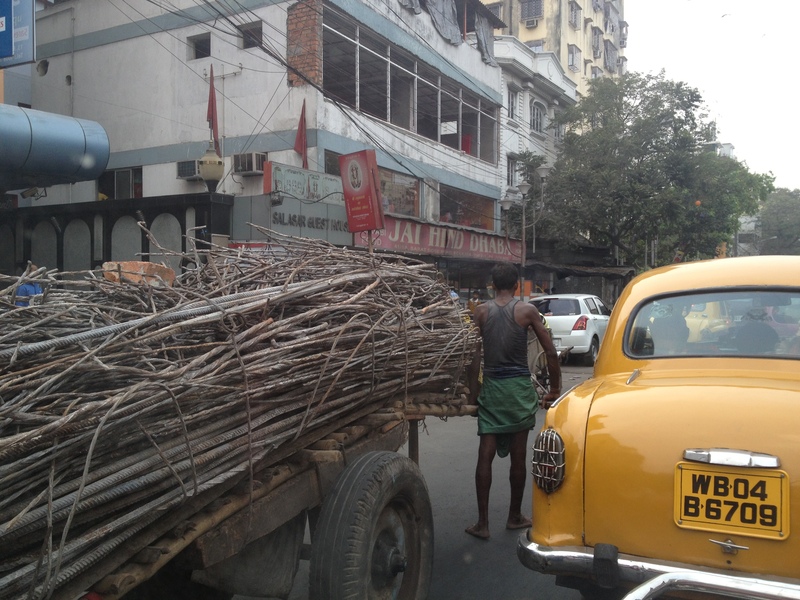 In Kolkata traffic en route to my speaking engagement this morning. While there are many reasons I enjoy returning to Kolkata, the best reason of all is that I love the people here — the beggars, the waiters, the rickshaw wallas, the shop keepers, the wonderful folks at the guesthouse, and my friends who are champions for justice. Every time I return they make me feel welcome. And that is the best feeling on earth when you are far from home. Welcome to Kolkata Omar. Indeed Kolkata is the most friendly place in India if not the world. Every Blessing to you as you share with Justice projects and the local people. We miss it so much. Thanks, Paul and Sarah. I know how much you love this city and its people. Thanks for always having Kolkata in your hearts and for praying for the spiritual welfare of all who call this amazing city their home. They welcome you back because you welcome them in to your heart. You genuinely care, smile, look them in the eye, engage them in conversation, encourage them, offer help where you can and pray for them. What this world would be with more Omars! Thank you, Carol, for your very nice and encouraging words. I appreciate your kind encouragement. Omar, I always appreciate your writings and your choice of words. However, today, I question your use of the word “stroll” when describing your travel between the Guest House and the restraurant across the street. My many transits between these two locations were more like scrambling an obstacle course or gauntlet although I agree any traveller should stop and smell the roses along the way. I can almost taste that sweet corn chowder now. Enjoy your visit and thank you or your continued ministry to these people. LOL. You’re right, Jeff. Crossing AJC Bose Road at that point is more like the old Frogger game.